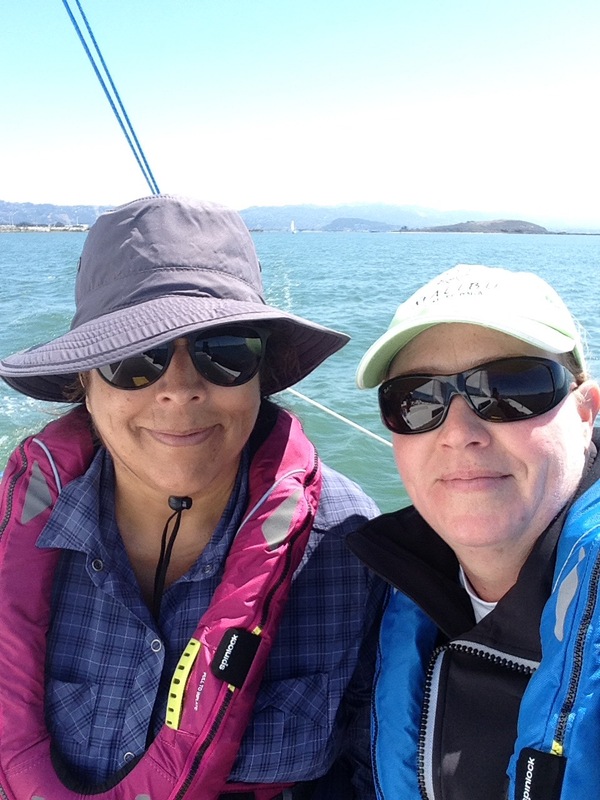 That’s the co-owner in the purple hat, enjoying her first sail on her new ship. And how nice to share the day with her pal Leslie! As a student sailor, Jeanne asked for a job aboard but I countered with asking her to get a feel for the boat on all points of sail without worrying about techniques or traffic. 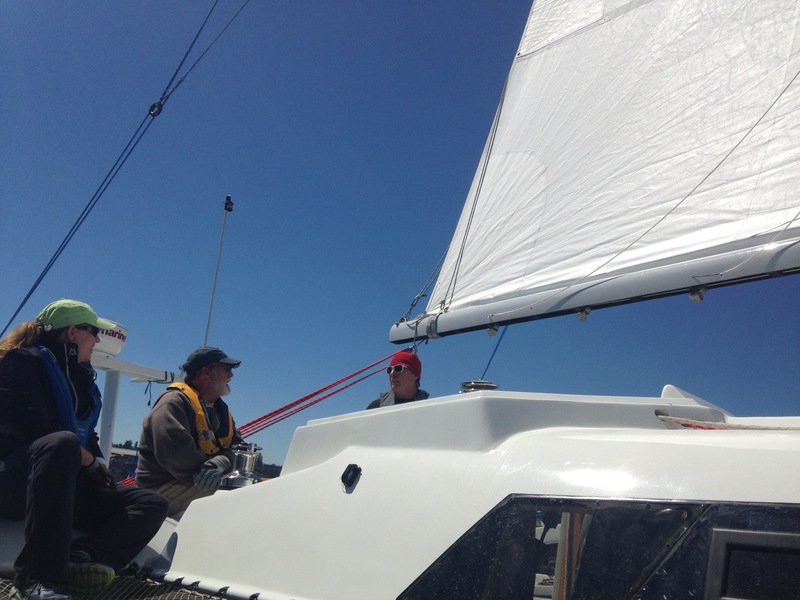 Charlie came to sail (already the Ravenswing veteran co-driver) and RickW sailed aboard for his first time. 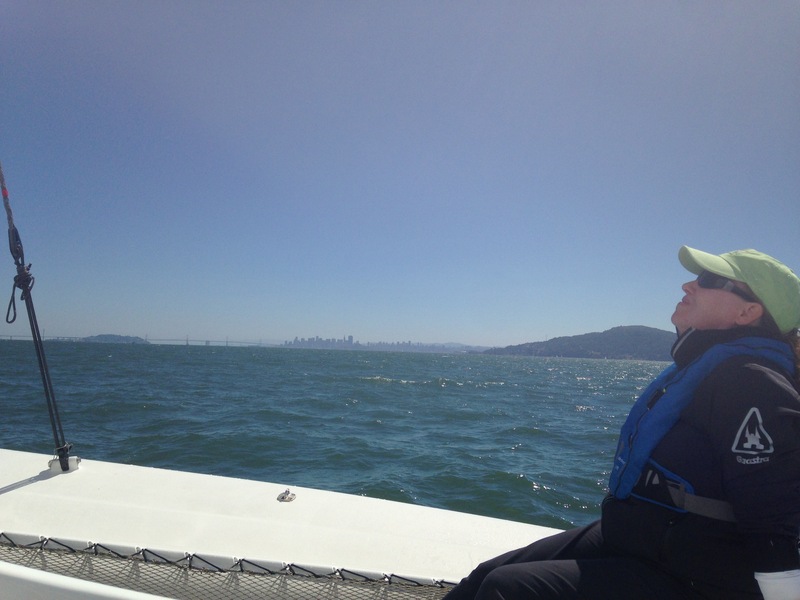 The Marin waters provided ideal sailing today – flat seas, lots of boats to catch, breeze to charge upwind at 9kts, and full sunshine. With lots of hands aboard, the owners got to relax and check out various places to sit. Jeanne is the first to sail from the aft swim steps, and it’s a great little spot. 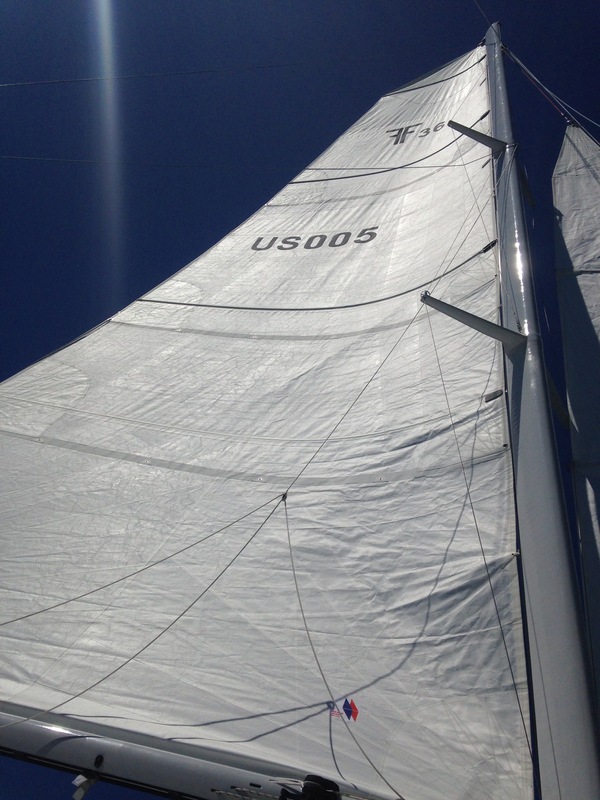 With the jib reefed, the clew is up high yielding lots of comfortable foredeck. 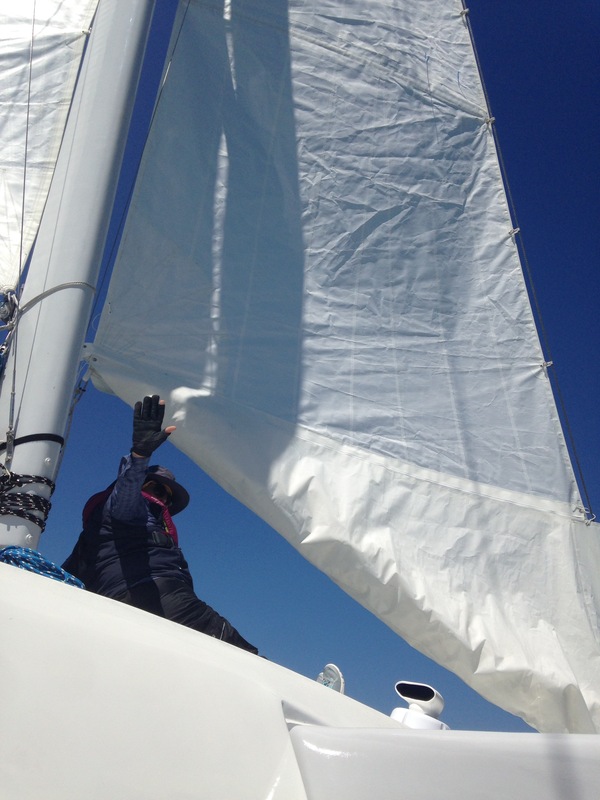 Compare last week’s photo with this and see we got the excess sail properly tied and zipped in to its cover. 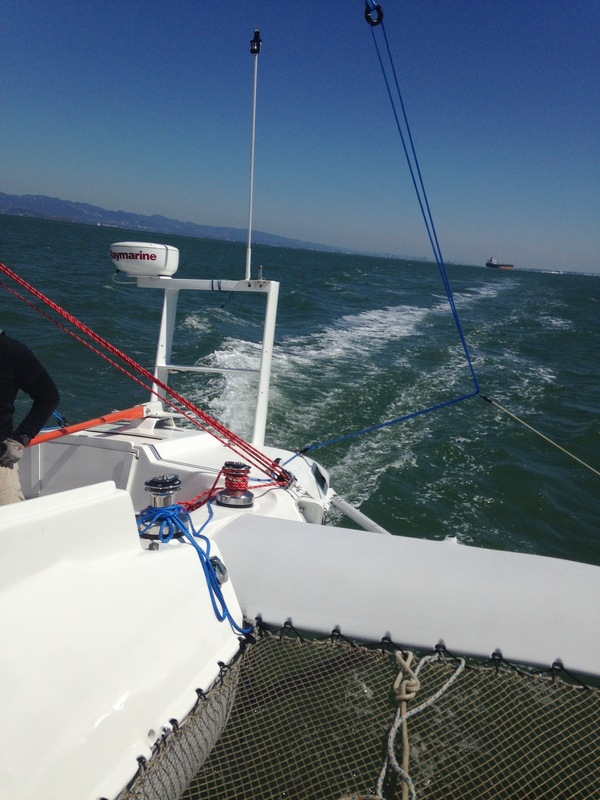 As we headed for Sausalito I wrestled my tiller away from the guys and spiced things up with a full charge up the channel, way above the motoring speed limit, dodging all forms of watercraft. The crew anxiously called out every boat and paddle board as if I was a blind man, but we kept on to go get a view of Tom Siebel’s Mod70 tri Orion, Sig45 open deck luxury racing cat, and huge Protector with four 300hp outboards. Wow does that guy put millions in to the sailing habit. So while the super rich have staff to keep their boats expertly tuned, the mere mortals have to solve their own heavy weather helm. This morning we installed the shims on the daggerboard head. Definitely tightened the board in the case, but it didn’t help the rounding up. So now it’s on to making rudder changes. Rick is concerned the trim tab may be to blame, and we’ll get the original rudder painted this week to try on Labor Day. We’ll make a new spacer to push the top of the rudder aft and the bottom forward; the axis point may be wrong. Still a worry to solve this nagging issue. But the best part of the speed run was Jeanne in the cabin enjoying the excitement from a comfortable window-side couch; we’ve come a long way from scary wet rides on the F27. Tinkerers, let’s hear your thoughts on the noisy dagger. It’s shimmed and it got that slanted trailing edge a few weeks ago. At 14kts it makes a bloody racket. How are we going to quiet this down (without hiring MOD70 Orion’s shore team)? A sailboat on a day like this in a place like this is hard to beat. Leslie’s getting a big view of the Oakland / SF bridge; it’s your turn readers, just drop us a line. This entry was posted in Foils, Inspirations in sailing, rigging, Uncategorized by cartersboat. Bookmark the permalink. I’m speechless…which is hard to believe. Wow oh wow! Maybe I could hitch a ride in the cabin with jeanne next time I’m in town. Sounds heavenly. Hey Greg, Looking better and better. Weather helm and heavy steering are two different issues. One is the boats tendency to round up due to air/water foil misplacement, the other is resistance to the rudder being turned as a function of high water flow centering effect vs limited turning moment. We had discussed weather helm remedies but it sounds like the problem lies in the rudder design and as Rick suspected,the added area of the trim tab concentrated on the trailing edge sounds like the culprit. Good news is that the fix is simpler than relocating the board/rig. Lose the trim tab and go sailing. The trim tab was built within the existing footprint of Farrier’s F39 rudder design, so I’m not ready to blame that. Plus it will be a huge setback if the trim tab system doesn’t work – $3,500 invested in the windvane gear and 2nd rudder. Very much hoping here that the angle of rudder rake is the culprit, especially seems to explain a heavy helm. I can live with weather helm, but it’s got to be overall lighter to the touch (especially for an autopilot to be realistic). The topic goes on hold for the week while I paint the ‘plain’ rudder, shorten the tiller, install the extension stick socket, and paint the new tiller receptacle and steerer turning plate. Stay tuned! Goose, I’ll be using these blog posts to announce sail dates. And/or just text me whenever you’re in the mood!